This is a slightly truncated version of Weekly Indicators, as I'm preparing it before leaving on a weekend trip, where I will be doing my part to assist the recovery. 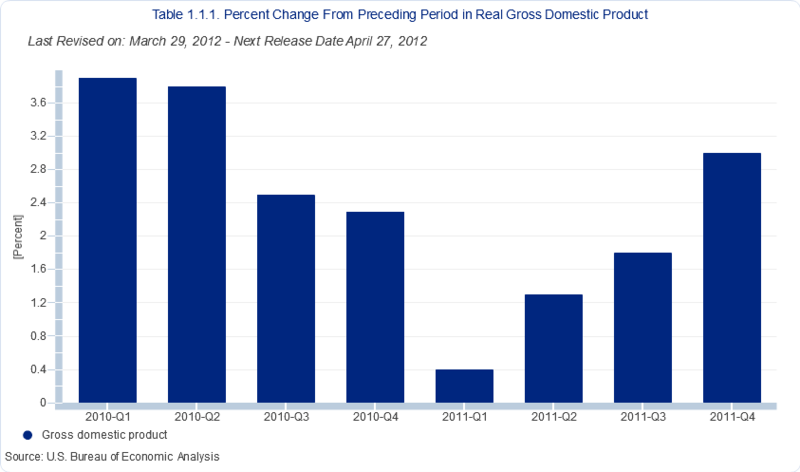 The monthly data releases this week included GDP, which was unrevised. The alternative GDI measure, however, came through very strong for the 4th quarter of last year. Case-Shiller house prices continued to fall. Durable goods rebounded, but did not overcome January's large drop. Chicago's PMI remained strongly positive. Consumer confidence increased. Personal income rose a little. Personal spending rose a lot. The savings rate declined sharply. Turning to housing, the Mortgage Bankers' Association reported that the seasonally adjusted Purchase Index increased +3.3% from the prior week, and was also +1.0% higher YoY. The Refinance Index decreased -4.9% from the previous week, reflecting higher rates and a pause before the new government refinancing assistance program starts. YoY weekly median asking house prices from 54 metropolitan areas at Housing Tracker were up +3.8% from a year ago. This number peaked at over +4% in February. It remains at odds with the Case-Shiller reports of worsening YoY declines in price for comparable sales, although the NAR, Census Bureau, and FHA average sales prices have also turned positive or within a percent thereof as of their last report. Typically non-seasonally adjusted home sales prices peak in about June, so we should see in the next 3 months whether asking prices capitulate or if comparable sales prices firm. The Department of Labor reported Initial jobless claims of 359,000 last week. The four week average declined by 3500 to 365,000, the lowest revised number in 4 years. Had there not been seasonal revisions, which increased recent weeks' numbers by 10,000 +/-1000, this week's report would have been almost exactly the same as last week's. There will be two more weeks where the new seasonal revisions will increase the number compared with the former adjustments, before turning lower later in April. The American Staffing Association Index increased again by one to 89. It is now well above last year's level is approaching its 2007 level. The Daily Treasury Statement shows that 20 days into March, $155.9 B has been collected in withholding taxes vs. $151.2 B a year ago, for an increase of 3.1% YoY. M1 fell -0.9% last week, and was lower by -0.2% month over month. On a YoY basis it rose to +17.2%, so Real M1 is up 14.4%. YoY. M2 fell -0.3% for the week, and up only +0.1% month over month. 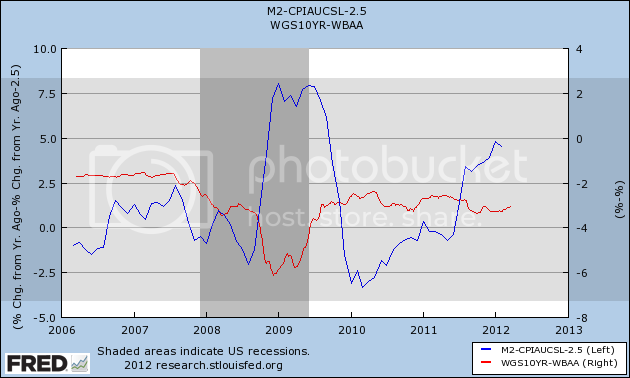 Its YoY advance fell to +9.6%, so Real M2 was up 6.8%. The YoY comparisons are becoming tighter (although still historically high), and have generally stalled on a weekly and monthly basis for the last couple of months, which is becoming noteworthy. Weekly BAA commercial bond rates rose +.06% t0 5.34%. 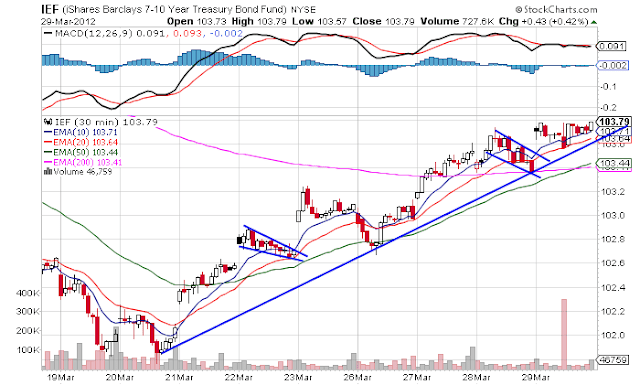 Yields on 10 year treasury bonds rose +.11% to 2.32%. The credit spread between the two, which had a 52 week maximum difference of 3.34% in October, declined another .05 to 3.02%. As I have previously said, narrowing credit spreads are not at all what I would expect to see if we were going into a recession. As they are a strong component of ECRI's WLI, this is probably a big part of why their growth index is no longer negative (it is exactly at 0.0). According to Prof. Moore's 1992 book, the first signal of a recovery after a recession is when the growth index rises to 1.0. In another couple of weeks, ECRI may have a lot more 'splainin' to do. Rail traffic remained negative but with the same explanation. The American Association of Railroads reported a -11,100 car decline in weekly rail traffic YoY for the week ending March 24, 2012, for a decline of -2.2% YoY. Intermodal traffic was up 10,400 carloads, or +4.2%, but other carloads decreased -21,500, or -7.2% YoY. The entire decline in carloads is still due to coal shipments which were off -23,600 carloads or -17.4%. Railfax's graph of YoY traffic by types remains in a positive trend but deteriorated again this week, also due entirely to the steep decline in coal hauling. The TED spread rose .01 to 0.41. This index remians slightly below its 2010 peak, generally steady for the last 6 weeks, and has declined from its 3 year peak of 3 months ago. The one month LIBOR remained at 0.241. It is well below its 12 month peak set 3 months ago, remains below its 2010 peak, and has returned to its typical background reading of the last 3 years. The Baltic Dry Index rose 22 to 930. It has risen 280 from its 52 week low, but is still well off its October 52 week high of 2173. The Harpex Shipping Index also rose 3 from 393 to 39 in the last week, up 18 from its 52 week low. 6Please remember that these two indexes are influenced by supply as well as demand, and have generally been in a secular decline due to oversupply of ships for over half a decade. The Harpex index concentrates on container ships, and led at recent tops and lagged at troughs. The BDI concentrates on bulk shipments such as coal and grain, and lagged more at the top but turned up first at the 2009 trough. Finally, through Thursday the JoC ECRI industrial commodities index fell from 125.74 to 124.47. This is the most significant decline in several months. I have serious questions how well this indicator forecasts the US as opposed to the global economy. The monthly data showed that the rebound has been real, no recession was "imminent" 6 months ago, and it pretty much takes contraction off the table for Q1 2012 as well. Further, while gasoline prices remain an ongoing concern, and while decreased mining, shipping, and usage of coal (probably due to the non-winter winter) will exert a negative influence on Q1 GDP, the remaining high frequency indicators were virtually all positive again this week. Consumers continuing to hold up is a very good sign for the economy going forward. I feel kind of bad continuing to pick on ECRI. Their 2009 end-of-recession call was a once in a generation bullseye. I appreciate their approach. I even understand, if I don't like, their need for a black box. But nobody's perfect. I certainly haven't been. And the evidence contrary to their recession forecast continues to accumulate. [T]he first signal of recovery ... is set off when the six month smoothed rate of change in the leading composite first goes above +1.0%." 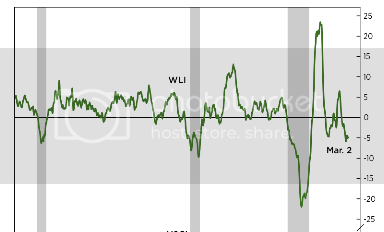 At the rate the WLI has been rising, it will be above 1.0 in two or three weeks. And their coincident index, which he relied upon in his March 16 reiteration, climbed above 2.0 in February and apparently climbed further this month. In fairness to ECRI, two of the four indicators of recession are quite weak -- real income has turned negative since December and industrial production was flat in the last month -- so ECRI's call could still prove correct, but more and more of their own arguments seem to be turning against their forecast. Now that we've gotten the final revision to 4Q GDP, let's take a look at the data for the last two years to see where we're growing and where we're not. The above chart simply shows the percentage change in GDP from the previous quarter. The first two quarters of 2010 were good, but then we saw a slowdown in the second half 2010. 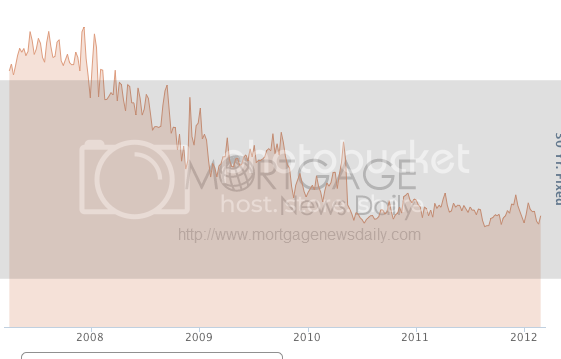 The first half of 2011 was very slow, but we see a pick-up towards the end of the year. Overall, we've seen PCEs bounce all over the place. First, notice that durables goods have grown by strong amounts on a quarter to quarter basis for the last two years. In contrast, non-durable goods purchases have been weak for the last year, as have service expenditures. Remember that durable goods purchases comprise the smallest amount of PCEs, coming in about 12%. This charts tells me that people are doing more for themselves -- that is, instead of hiring a landscape service, they're mowing their own yards, etc..
Investment also provides some interesting insight. First, we see decent quarter to quarter figures in equipment and software (the gold line). 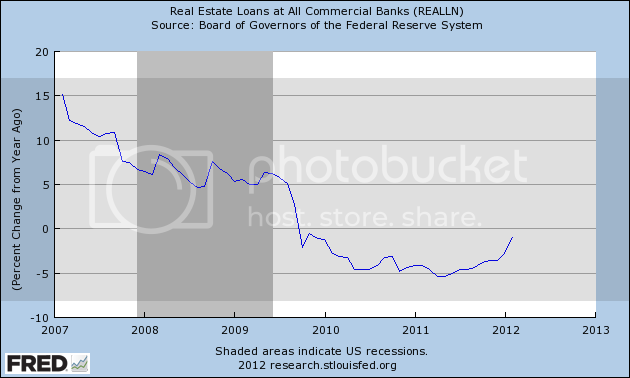 However, investment in CRE (the blue line) is fairly weak. Residential investment (the green line) is terrible, save for the 2Q10 and last quarter. Federal government non-defense spending (the green line) has contracted is four of the last six quarters, and state and local government spending as decreased seven straight quarters. The only area of government spending where we see any growth is in national defense spending. In 2010 we see a big increase in exports in four quarters, while imports increased in three quarters. However, both export and import growth slowed in 2011. The above data tells us some very important information. 1.) Businesses are not scared to invest; in fact, they have been investing at pretty strong rates for the last two years in equipment and software. So, can we please stop with the, "business is scared to do anything" argument? 2.) The quarter to quarter contraction in government spending at the federal and state level is hurting growth. Remember, government investment spending is a component of the GDP equation. I should also add that in a "socialist" government, we would be seeing the exact opposite. The 30 minute QQQ chart shows that this week's price action -- at least so far -- has been a total wash. Prices rallied on Monday and Tuesday, but retreated on Wednesday and Thursday. 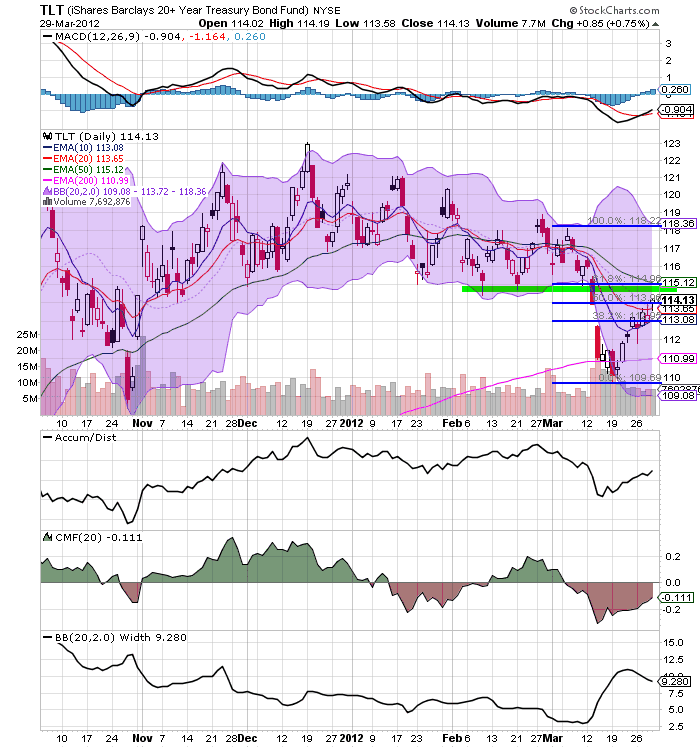 On the chart we see two important price levels: 67.4 -- which was hit near the end of trading on 3/21, and 67.2, which was hit on 3/22/. 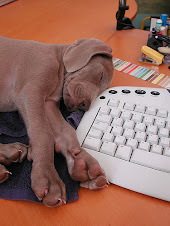 Both provide technical support. The IWMs are still having a hard time getting about the 83 price level, which has acted as a center of gravity for the last few weeks. While the short term (one month) momentum trend is positive, the longer term momentum trend (two month) shows a deceleration. But, so far, the other technical indicators are positive. 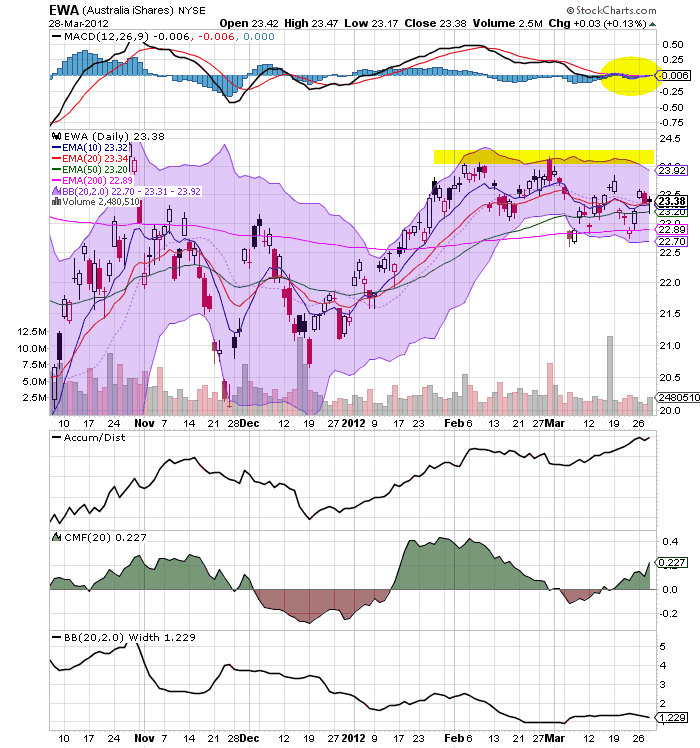 Like the IWMs, the transports are also having a hard time getting above an important technical resistance level, which here is right around 96.5. 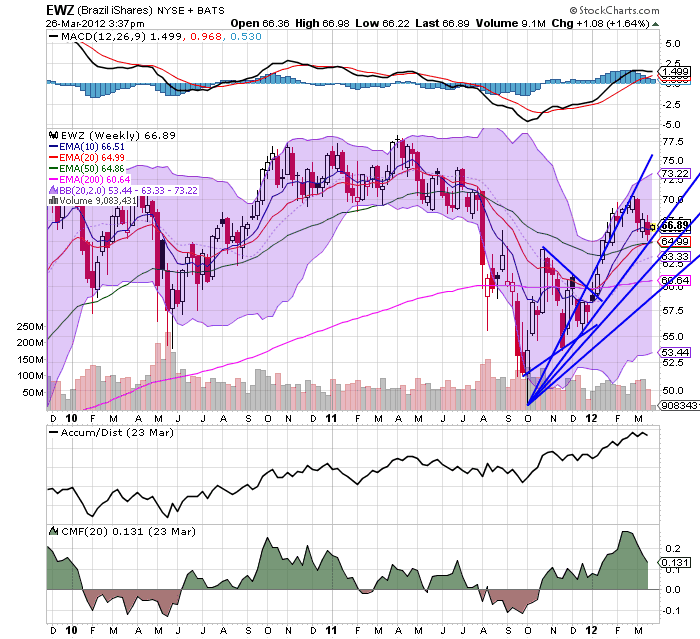 Also note the weaker MACD and EMA reading. In contrast to the equity markets, the treasury market has been rallying for the last 7 days. Prices are in a clear uptrend; along the way we see several downward sloping patterns to consolidate price action. 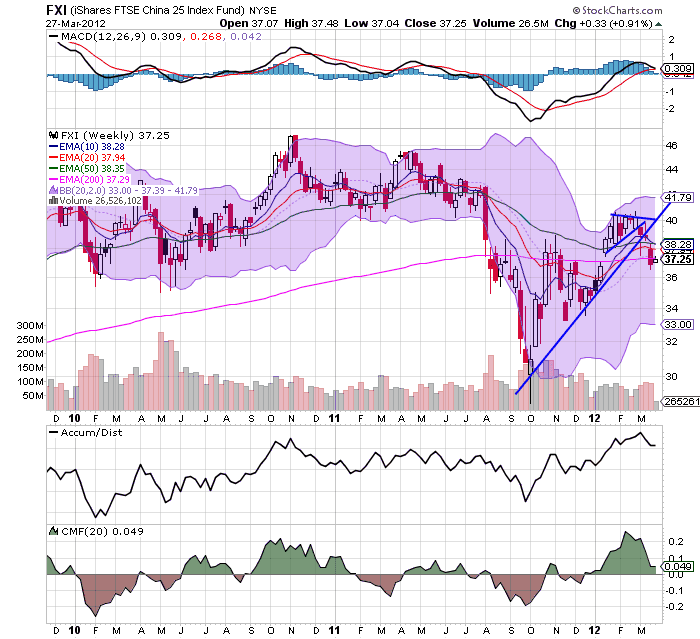 The IEFs daily chart shows that prices have now rebounded to the lows of mid-January. That's a technically important development that indicates the safety trade has returned to a fairly strong degree. The TLTs are not quite at the rebound levels of the IEFs, but they're approaching those levels as well. Consider the following: Asian markets are struggling as a result of China's market's drop; the BRIC countries are seeing their markets in a weakened position; the EU markets are hitting resistance; the US treasury market is rallying a bit after an important technical sell-off, and the transports and Russsell 2000 aren't participating in the rally. So, why are right-wingers on the blog list? Some months ago another progressive blogger took a shot at us because some very un-progressive bloggers are on our blog list. And both Bonddad and I have written some very pointed criticism of some of Mish's posts. So, here's why Mish, and Mark Perry, and Scott Grannis (Calafia Beach Pundit) are on the blog list. The blog list is designed to enable you to use this page as a jumping off point to read most if not all of the interesting economic and investing commentary that is published in any given day. Check in two or three times a day and you can tell very quickly if some good commentary on a point of interest to you has been written. In fact, that's exactly what I do. Mish is on that list because when he's writing actual data-digging commentary as opposed to gold-buggery or anti-union screeds, he makes me think. 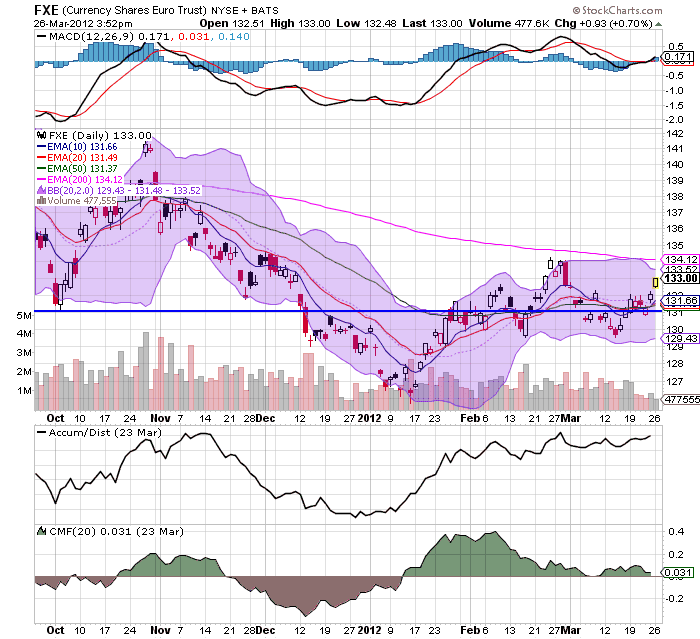 For example, this morning there's a good post up comparing commodity indexes with a variety of other indexes. Even if I disagree with his conclusions (which is probably at least 80% of the time), I have to think about why. His posts on the employment to population ratio are very good examples. He ignores Boomer retirements and has never acknowledged the Cleveland Fed and JP Morgan(?) studies. But unless and until you believe you can refute his arguments, they should be thought about seriously. That's a very worthwhile process. Similarly if Mark Perry or Scott Grannis simply regurgitates some Heritage Foundation talking points, it takes 2 seconds to click away. But both bloggers have been data driven, and optimistic about the economy, for several years. When world trade fully recovered and exceeded its pre-recession levels, nobody else noticed. But they did. As energy exploration in North Dakota started to impact US energy import levels, nobody else noticed. But they did. In short, they are the perfect antitode to permabears. If you haven't clicked on any of those blog updates that scroll down throughout the day on the right hand side of the page, you really ought to try some out. Can the US Markets Continue Rallying With the Weekly BRiC Charts Showing Weakness? The Chinese market has broken the upward sloping trendline and is now through the 200 week EMA. 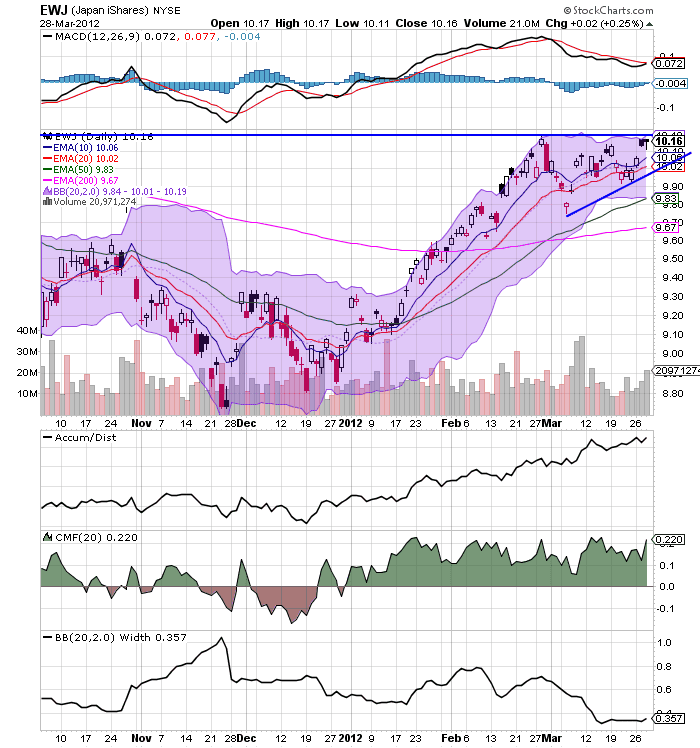 However, we also see decent underlying technicals on this market as well. The Indian market has rallied to just above the 200 week EMA, around the 62 price level, but has now moved to the 55. 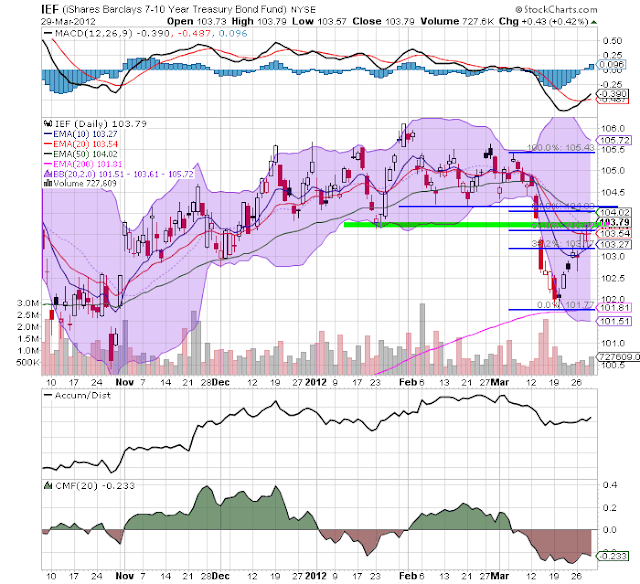 7 level, or the 61.8% Fib level. 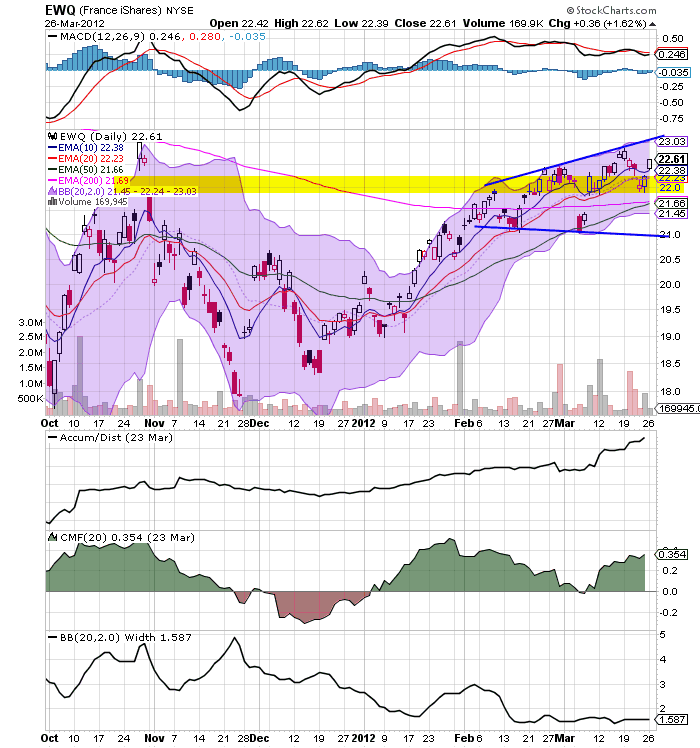 But again, we see strong underlying technicals. The Russian market's price action is very similar to the Indian market's price action. After rallying to around the 34 price level, prices have retreated to the 31 level which is also right around the 200 day EMA. What's important about all of the developing markets is they are all in retreat to some degree. 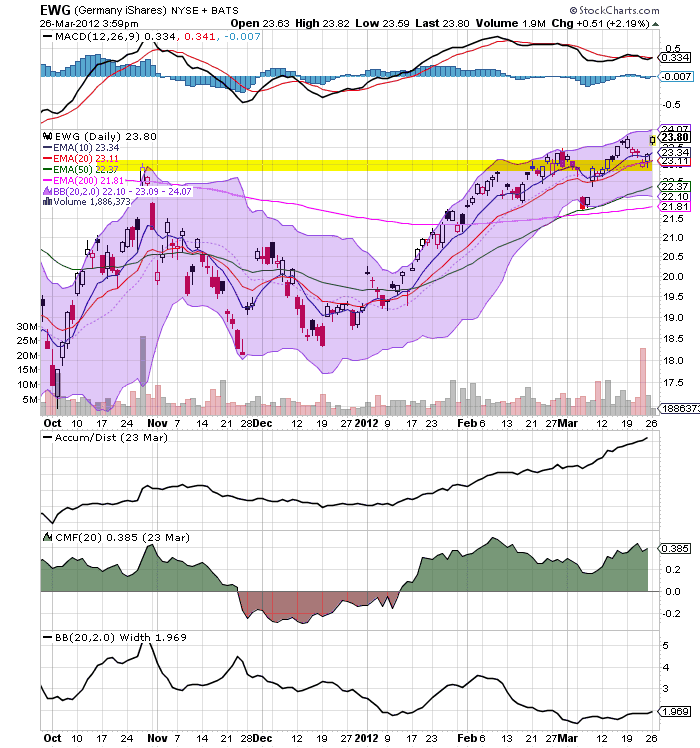 While the retreat is not an all around massive sell-off just yet, it does indicate concern on the part of traders regarding the growth prospects for the developing world. In addition, the Chinese chart should be of considerable concern, as it has dropped below the 200 week EMA and has broken an important, medium term trend line. Today I want to focus on the Asian and Australian market to show how "China-centric" these regions equity markets have become. 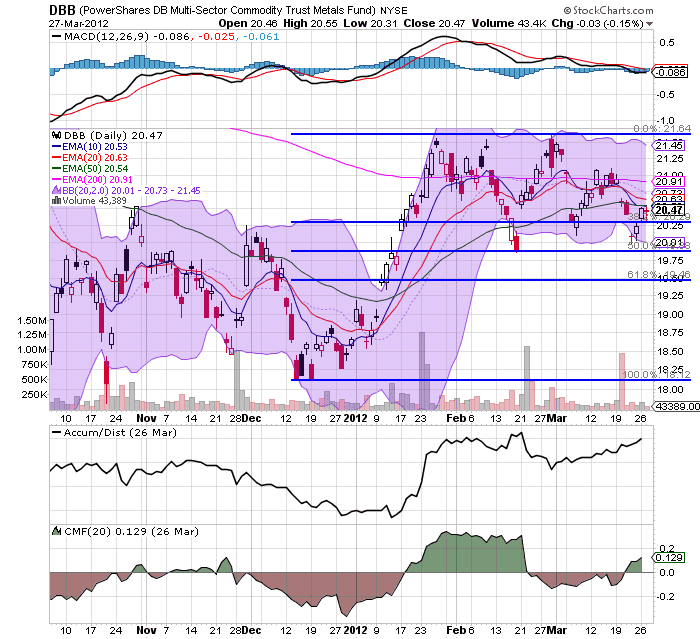 Over the last month or so, there has been increased talk and analysis to the effect that China is slowing down. 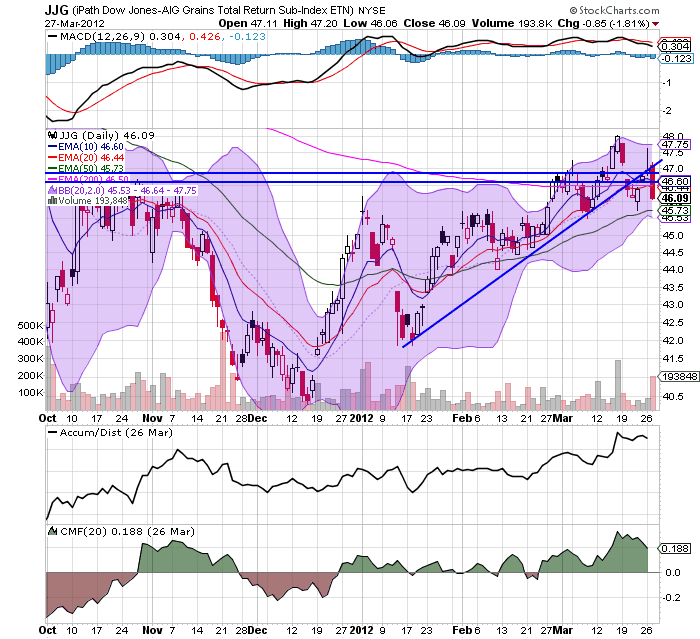 And while the US market is rallying, Asian markets are focusing on China's decreased activity, thereby keeping them lower, or at least preventing them from participating in the US market's rally. The China ETF hit a high in the 40.5/40.75 area in early February. After that it moved sideways for a month and is now drifting lower. Notice that prices are now trading between the 50% and 38.2% Fib level and are in a "lower low and lower high" pattern. The shorter EMAs (10 and 20) have crossed below the 50, the CMF has dropped and momentum is decreasing. 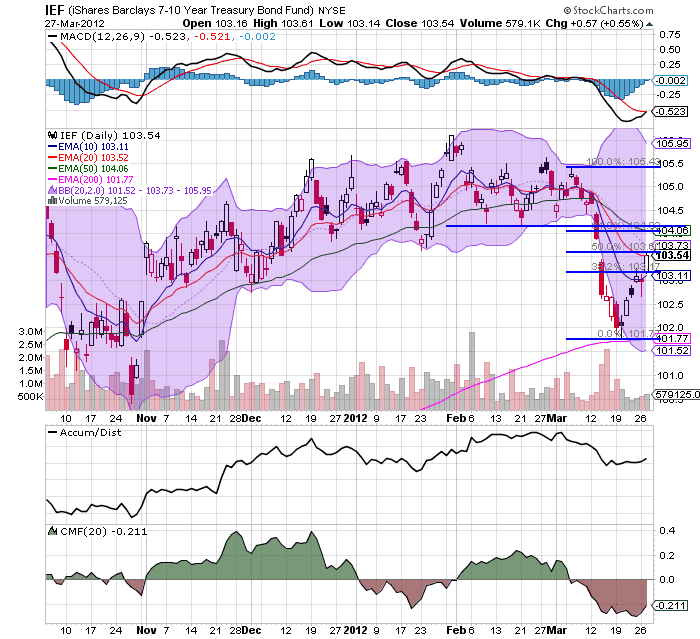 The Australian ETF has hit the 24 area twice since early February, but is now drifting lower. 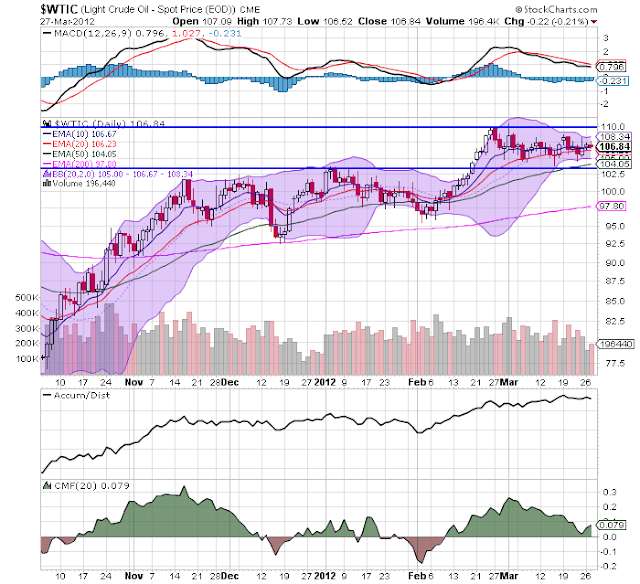 However, prices have found support at the 200 day EMA and the shorter EMAs are less bearish. Plus, the volume and momentum indicators are now slightly bullish -- although prices still have the previous resistance around 24 to get through. 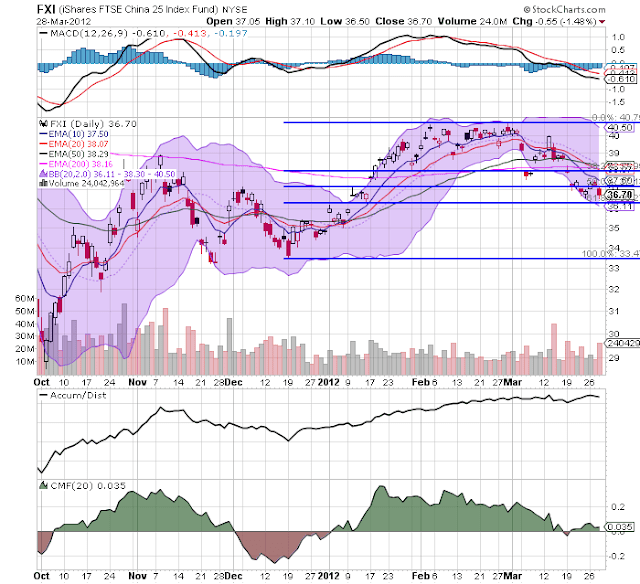 The Hong Kong market hit resistance around the 18.5 handle and is now also drifting lower. But this chart is more like the Australian chart, which means it is hardly in a "super bearish" stance. Prices are moving more sideways than down. The shorter EMAs are tangled, but are still above the 50. The volume indicators are slightly bullish, but momentum is still decreasing. 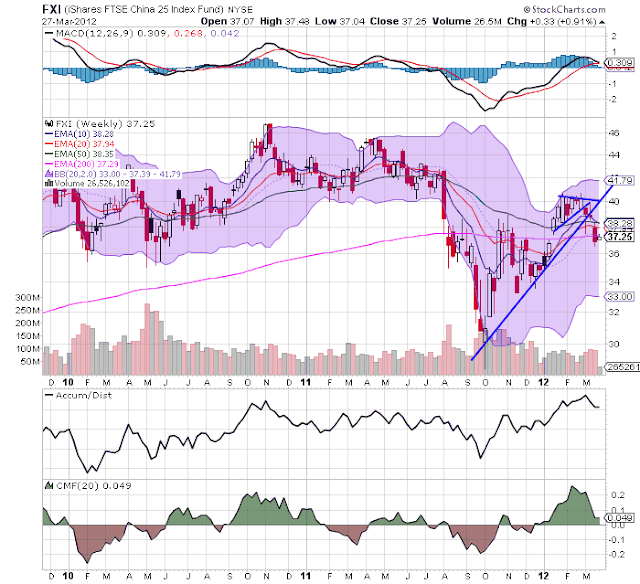 The Japanese ETF is forming a loosely configured triangle consolidation pattern. 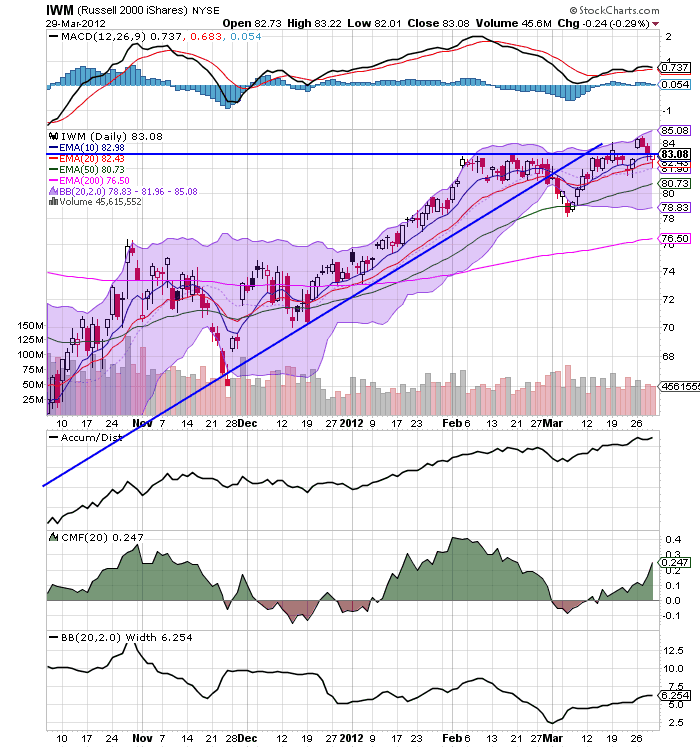 There is resistance at the 10.2/10.3 level, but we also have a rising trend line supporting prices. The shorter EMAs are still in a bullish configuration, while the volume indicators are bullish. Although the MACD is decreasing, it is about to give a buy signal. 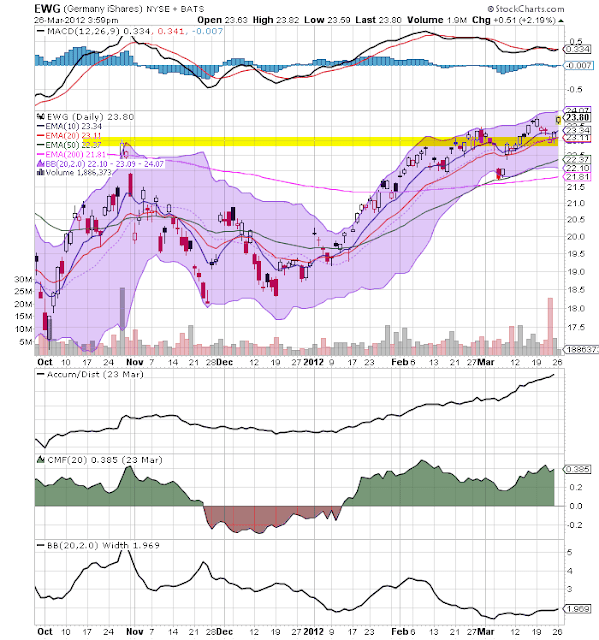 The South Korean market is drifting higher. 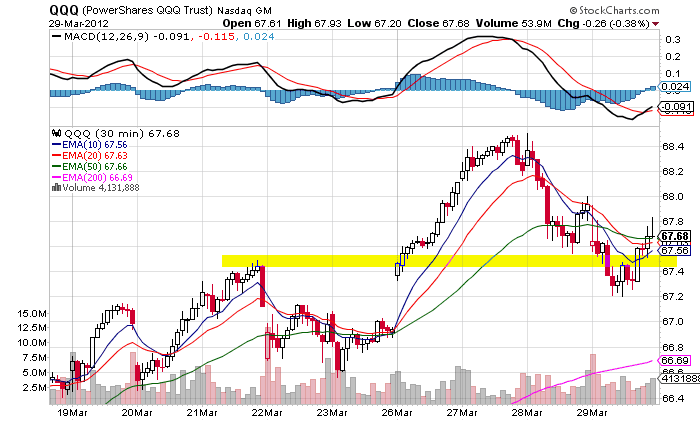 There is some solid resistance at the 61 area. The shorter EMAs are still moving higher, but barely so. However, the volume indicators are still bullish, although momentum is still weak. Some of these charts (South Korean and Japan) could be viewed as consolidating after gains, with the others (Hong Kong and Australia) simply moving sideways/slightly higher. But that has to be seen against the backdrop of the Chinese market, which is clearly moving lower. There is also the issue of a clearly weakening yen and the possible negative effects that might have on the region. In short, this part of the trading world is not caught up in the US market's latest move higher, which should concern US traders. 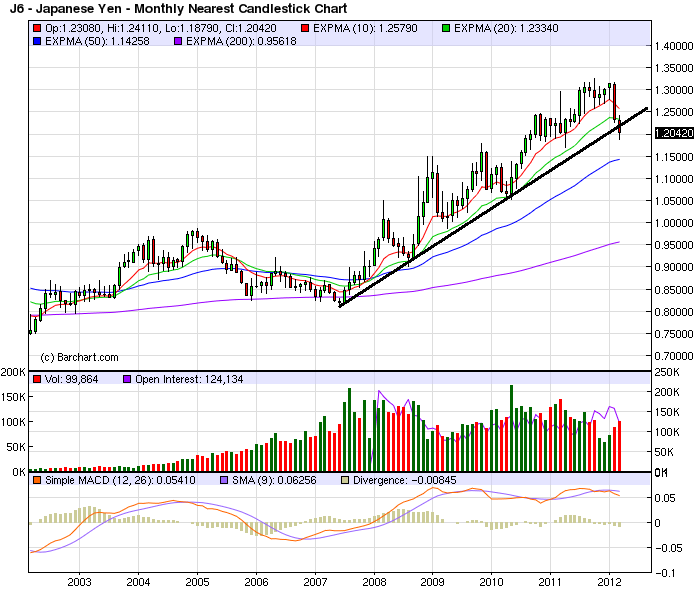 The above chart is a 10 year chart of the yen. For the last four years, it has been in an upward trend. However, it is now just through crucial support levels. 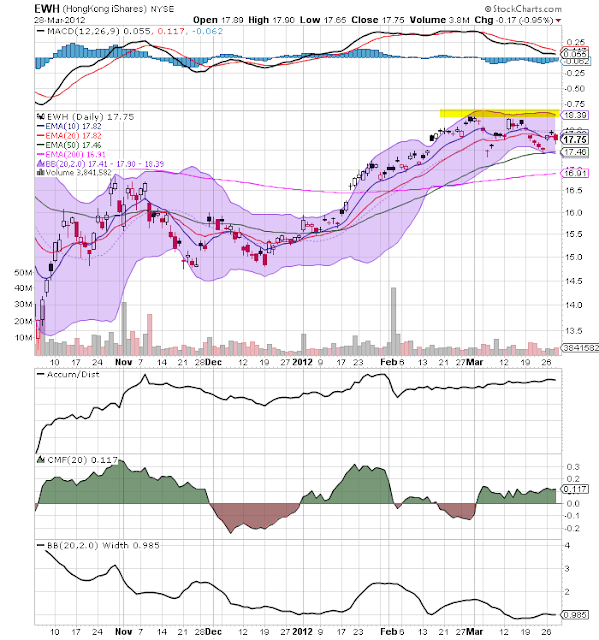 Prices have moved through the 10 and 20 week EMAs and the MACD has given a sell signal. 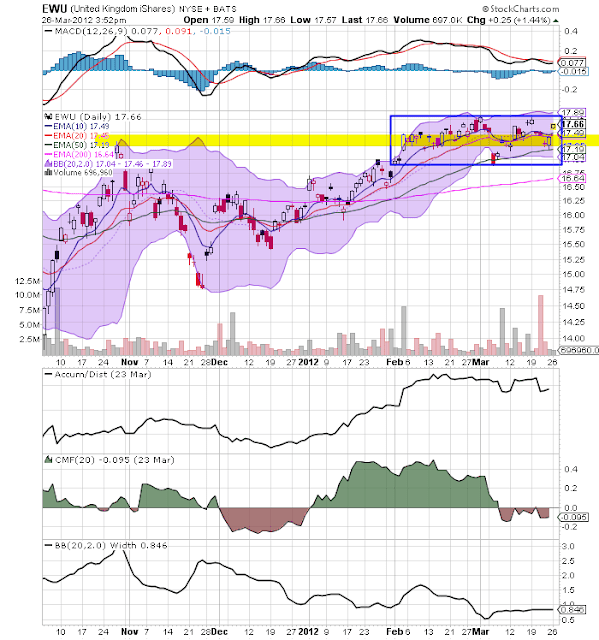 In short, this chart is looking to drop sharply now. The central bank also said it would broaden a lending program to growth enterprises by 2 trillion yen ($24.35 billion), bringing the size of the program to 5.5 trillion yen. In addition, the lending scheme will be adapted to access U.S. dollar reserves held at the central bank for loans denominated in foreign currencies. The BoJ also announced an arrangement to help small lenders that were ineligible under the original rules of the Growth-Supporting Funding Facility. Speaking at a news conference later in the day, BoJ Gov. Masaaki Shirakawa told reporters that the boost to the lending program was designed to work in conjunction with the credit-easing moves unveiled last month. The balance of trade turned negative after the earthquake over a year ago, as this forced Japan to import more oil. The current account balance -- which is a broader measure of international trade -- just printed a negative number. In short, one of Japan's primary international advantages may be going away, which means the the yen has to drop. Japan has lost competitiveness in a swath of industries that it used to dominate. Its automobile industry is losing out to Germany, South Korea and the United States. Japan’s automobile industry used to be competitive in cost and far superior in quality to its global competitors. But the world has changed. The yen EURJPY +0.17% has dropped below 110 from as high as 160 against the euro. The South Korean USDKRW +0.24% won was about ten against the yen and is now 13. Cost-cutting cannot offset such a big change in exchange rates. The U.S. auto industry cut its labor costs and debt burden through the government bailout. It is now more competitive than Japan’s. Japan’s electronics industry, still significant to its economy, is losing out big time to its Asian competitors. Nothing hot in electronics is made in Japan now. U.S. companies like Apple AAPL +1.13% leverage China’s manufacturing sector to turn out hot products. South Korea is embracing the vertically integrated model and churning out competitive products like Japan used to. Nothing symbolizes Japan’s decline like its electronics industry. It was the envy of the world and had all the ingredients to take the industry into the mobile internet era. Instead, it embraced insulation and made products just for the Japanese market. Now it is almost irrelevant to the outside world. Japan has only one way out — a massive devaluation. If the stable national debt is 120% of GDP, the yen needs to be devalued by 40% because devaluation is ultimately equal to the nominal GDP increase. The devaluation is likely to sustain 2% to 3% of nominal GDP growth for Japan beyond the repricing induced increase, which is necessary to restore Japan’s tax revenue. Deflation has caused Japan’s tax revenue to decline as a share of GDP. It can be only reversed through restoring nominal GDP. A devaluation of 40% can restore Japan’s competitiveness against Germany and South Korea, which will lay the foundation for Japan’s industrial recovery. Overall, it's not a pretty picture that is emerging. Several data series used in economic indicators may have special issues rendering thier signals misleading. Two important ones are both components of ECRI's Weekly Leading Index. 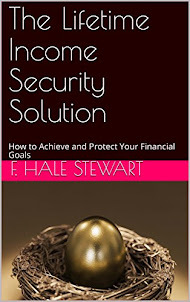 The first is purchase mortgage applications. Yesterday I wrote that the WLI would probably be more positive if ECRI were continuing to include its original real estate measure, the FRB's weekly H8 report. Beyond that, however, purchase mortgage applications, which have been flat to slightly declining for almost the last two years, are in stark contrast to housing permits and starts, which are at or near 3 year highs. For example, housing permits are 200,000 higher than their low point in early 2009. The difference appears to be explained by the large number of all-cash sales, which ran at 33% in February. Purchase mortgage applications obviously don't pick up these cash sales. And it's housing itself, not mortgages, with which we are mainly concerned when we think of leading indicators. New houses have multiplier effects in construction, landscaping, appliances, tools, and maintenance which play out over several years. If there is an unusually large percent of cash sales, the multiplier effects from those are being completely missed by the WLI. The question here is, is the index really measuring strength and weakness in the US economy, or is it actually a better barometer of the global economy? After all, prices, supply and demand for industrial commodities is set globally, not locally. The rising export dependence of these [suppliers of suppliers] economies, with growing involvement in global supply networks, makes it increasingly difficult for economies to decouple, especially for suppliers of early-stage goods that have embedded themselves further up the supply chain and farther away from the final consumer. This makes them highly vulnerable to the Bullwhip Effect and at the mercy of cyclical fluctuations in end-user demand growth. 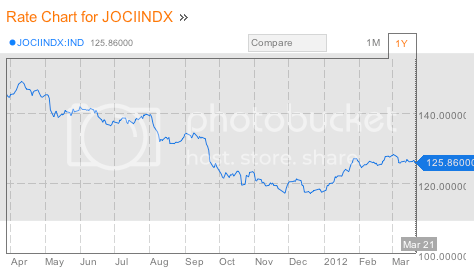 First of all, the JoC ECRI index was developed 30 years ago when the US was the dominant factor in commodity usage. If the world has become much more intertwined, i.e., the market for commodities is global, and if supplier economies such as China are the largest purchasers of raw commodities, then it follows that the index is probably primarily measuring strength or weakness in these supplier economies, not in the downstream consumer economies. Further, it is necessarily true that if supplier economies are especially vulnerable to cyclical fluctuations, then economies which are primarily consumers of end stage goods, like the US, are the least vulnerable. If supplier economies are especially unable to decouple, then it followers that consumer economies are the most likely to be able to approach decoupling. 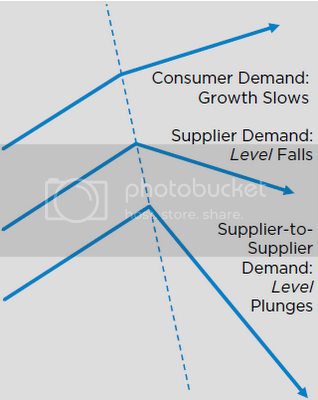 [D]eveloping economies are very much subject to the Bullwhip Effect, where small fluctuations in consumer demand growth get amplified up the supply chain into big swings in demand as we move away from the consumer. So, smaller shifts in end consumer demand growth translate into larger fluctuations in intermediate goods demand, and even bigger ones in input material demand, and especially, raw material prices. In other words, an absolute contraction in supplier countries can be caused by simply continued growth, but at a slower rate, in a consumer country. Which means that converse is also true: an observed contraction in supplier economies (like China) does not necessarily mean that there is a contraction in consumer economies (like the US). Rather, consumer economies may simply continue to grow, just at a slower pace. Unless I'm missing something, that arrow at the top for consumer countries in ECRI's diagram is still pointing UP. So ECRI's own presentation suggests that their own indicator, the JoC ECRI commodities index, forecast a global downturn via its downdraft in the second part of 2011. But just as a recession in the US doesn't necesssarily mean a contraction in, say, Texas, so the global downturn measured by the commodities index may only have forecast slower growth in the US consumer economy. ECRI's own presentation indicates as much. Oops! Yesterday, the grain complex took a big hit, as traders dumped the corn contract. Prices have now moved through the late October price level twice in the last two weeks, indicating weakness. The big news for this market coming up is the crop report on Friday (shades of Trading Places, I realize). 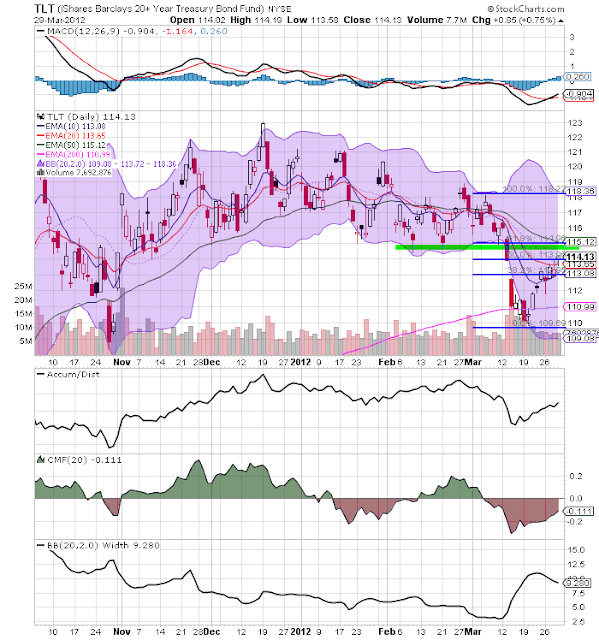 Industrial metals are still bouncing between the 200 day EMA (right below 21) and the 50%/61.8% Fib level. While we see declining momentum, the volume indicators are positive. However, the shorter EMAs (10 and 20 days) are declining, while the 50 is just turning a bit negative. The oil market has been trading between 104 and 110 for the last month. 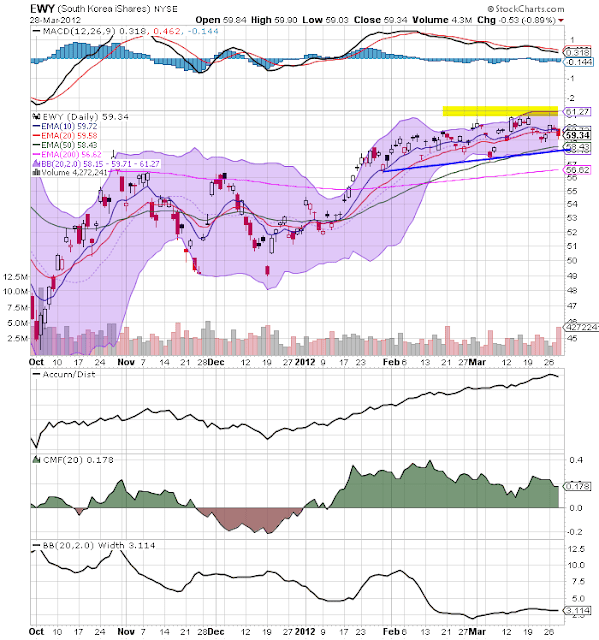 Momentum is decreasing and the shorter EMAs are trading in a very tight range. While the other averages have broken through resistance, the transports have not. Instead, they've been contained by resistance just north of 96. 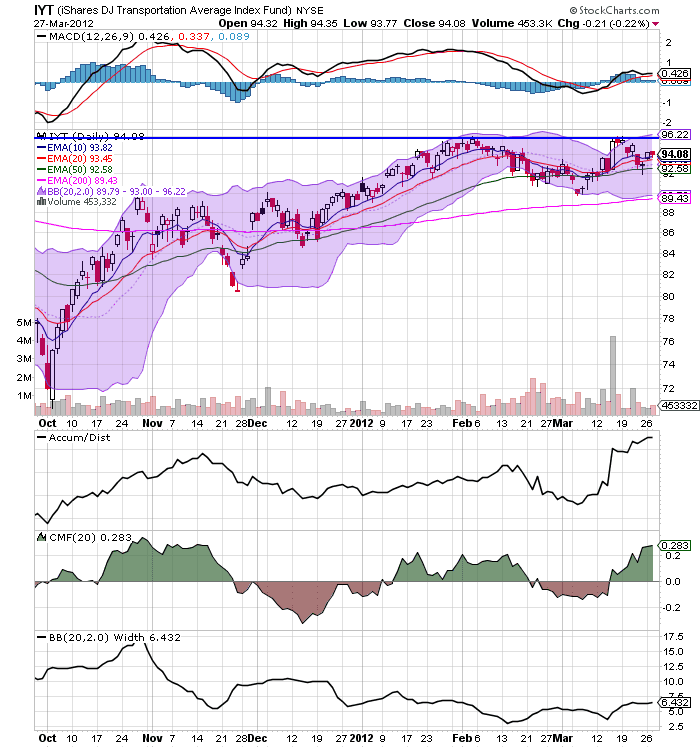 While the EMAs are fairly shallow, the volume indicators are rising. 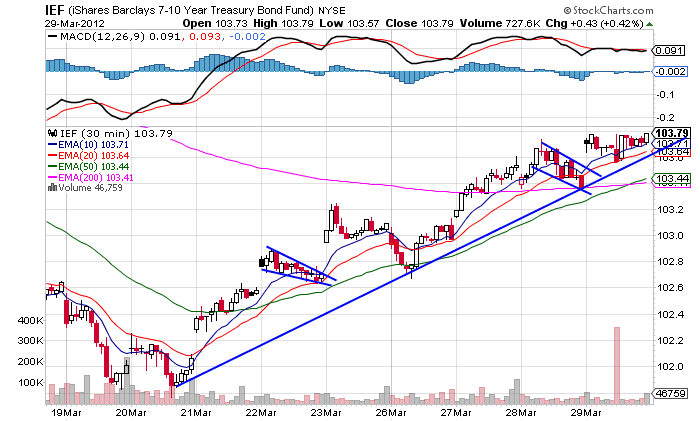 The treasury market is still rebounding from its low just north of 101. 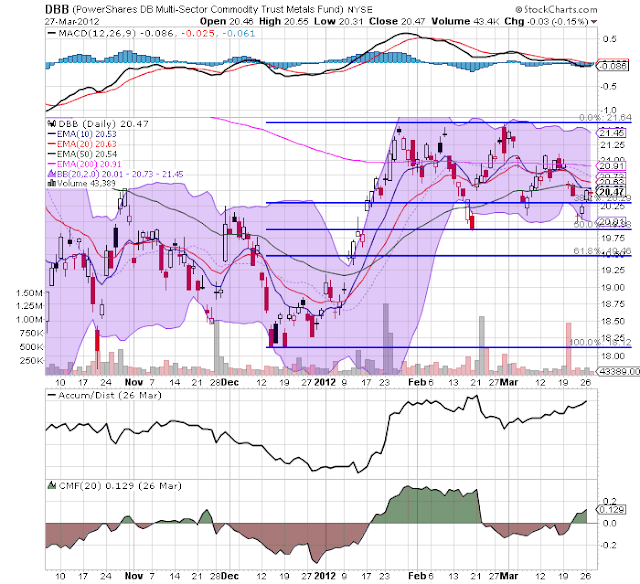 Prices have moved through 38.2% Fib level and the 10 day EMA are are now right at the 50 day EMA. The 104 price level is very important for this chart, as that is the support area of the trading range the IEFs were in for the first two months of the year. The commodity charts should concern the bulls. In a growing economy, we should be seeing these move through resistance -- especially the industrial metals. However, they're treading water. The good news is they're not falling sharply. The bad news is they're not rallying. 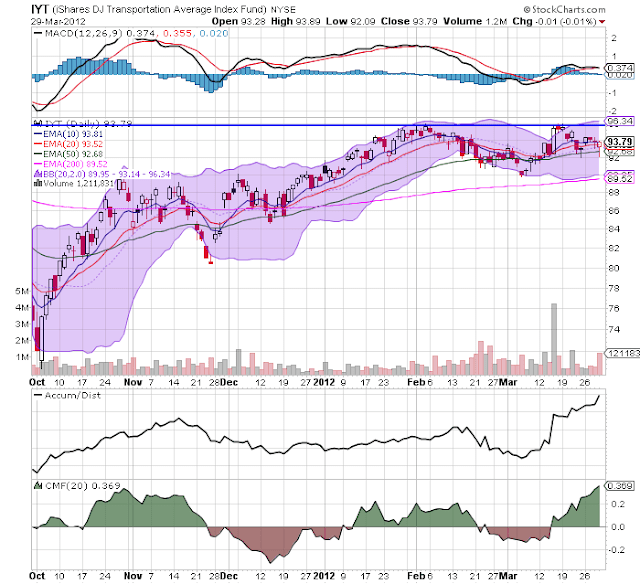 The lack of confirmation from the transports is not fatal to the other averages, but it does add a sense of caution to any advance. 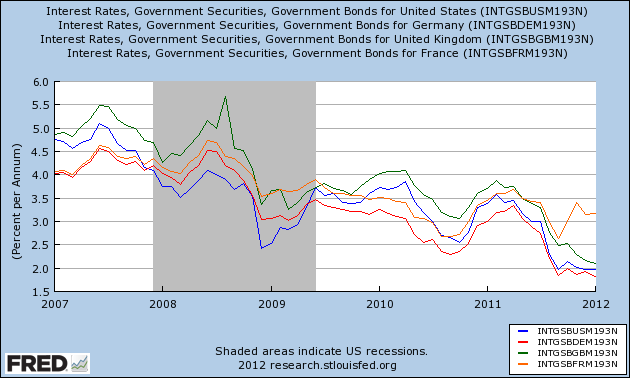 Finally, the rebounding treasury market can, so far, be attributed to short-term bottom fishing. But, we need to keep an eye on where prices move. How to make an economic index subjective: change it! Over the last week I've been re-examining and updating my January forecast. While I believed there would be weakness in the first half of the year, I considered it unlikely that it would bring about an actual recession. This puts my view at odds with ECRI's (although it is right on point with the contrary viewpoint of the Conference Board, publishers of the official LEI's). So why am I not persuaded by ECRI's latest arguments? A number of reasons. First of all, believing that the seasonal adjustments after the 2008 recession may be suspect isn't grounds for disregarding them and instead adopting a view based on more lagging year-over-year metrics. That simply means that the seasonal numbers MIGHT be wrong, not that they ARE wrong. So if the monthly and the YoY trends disagree, it only means that we can't be sure which is right, NOT that the YoY trend is correct. Secondly, coincident indicators are coincident, period. They should not be interpreted as leading. Finally, I believe that ECRI has changed the make-up over several of its indexes in the last 20 years. This reflects a subjective, editorial judgment. Where the two versions of the index diverge, extra caution is warranted. In fact, I believe ECRI is being misled by several series upon which it relies heavily, which either no longer mean what they used to for the US economy, or are having unique problems (more on which, tomorrow). The WLI contains seven major economic indicators, including mortgage applications for purchase, money supply, sensitive industrial prices, bond yields, bond-quality spreads, stock prices and weekly jobless claims. Does the substitution of the MBA's purchase mortgage index for the FRB's weekly H8 release make a difference? Absolutely. This shows the H9's recent history in more detail, through February. It is now at 0 on a YoY basis. If the FRB H8 release were still part of the WLI, there would have been a sharper decline in 2009, and the period of flatness would have ended a year ago, with an increasingly stronger move upward since. An even more important change is the Conference Board's explicit dropping of Real M2 as a component of its index. Just as importantly, although Real M2 is included in both Professor Moore's 1992 list of the WLI, confirmed by its inclusion in the Business Week index in 1993, and reconfirmed by Achuthan in 2002, it now appears that ECRI has also either trivialized or completely dropped Real M2 as a component of its WLI in favor of credit spreads. Both of these were essentially caused by the same thing: Europeans fleeing European banks and making deposits in US banks and purchasing US treasuries. M1 and M2 skyrocketed, while credit spreads blew out. 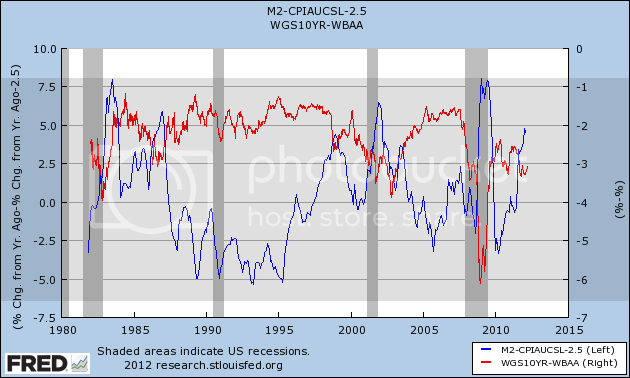 Indeed, if real M2 were still part of ECRI's WLI, it is hard to see how it could have gone negative at all. Add the difference in H8 to that, and it is very unlikely that ECRI would have made a recession call last year. Beyond that, while the Conference Board deleted Real M2, it was at least transparent, and also the changes in the LEI did not change the ultimate direction of that set of indicators. 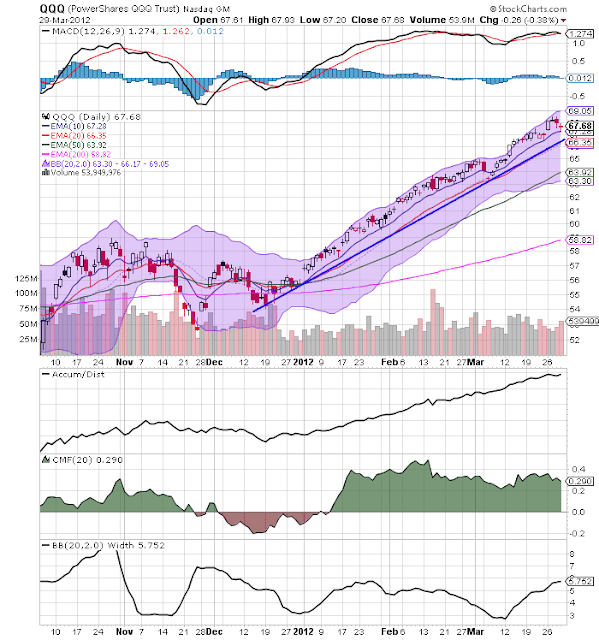 In the case of the WLI, if I am correct, the decision DID change the direction of the indicators. Further, this decision was inherently subjective, a matter of human judgment. So ECRI's recession call is not compelled by objective data. Rather, it is a function of a subjective *choice* as to which objective data were left in the index and which were not. When such a choice leads to conflicting outcomes, extra caution is warranted. Consider the following information from Markit. 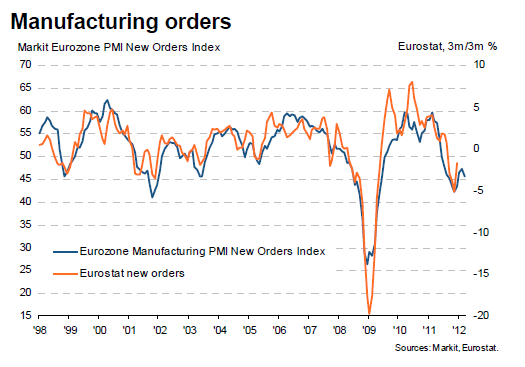 This is their respective PMI for the manufacturing and service sectors in Europe. All countries dropped at the end of last year. 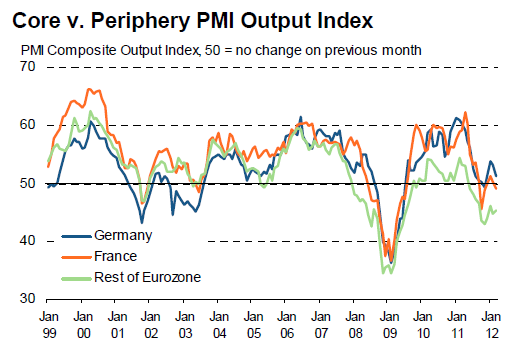 Only Germany has a positive PMI -- and that is a weak reading. New orders have been declining for the last year and are now slightly negative. 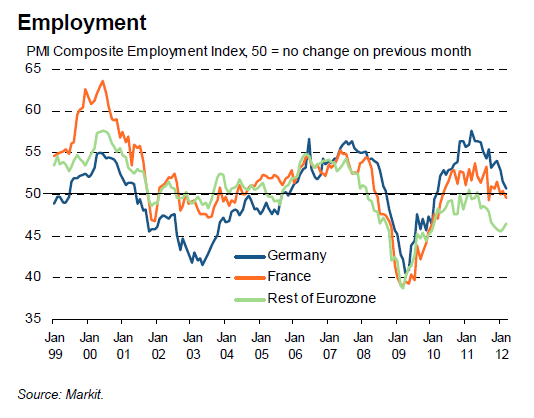 Overall, employment is weak as well, with only German showing a positive number. Above is the latest IFO Business Climate Number from Germany. This number appears to have rebounded somewhat, but it is still showing a weak reading. Overall, EU growth has been pretty low for most of the recovery. 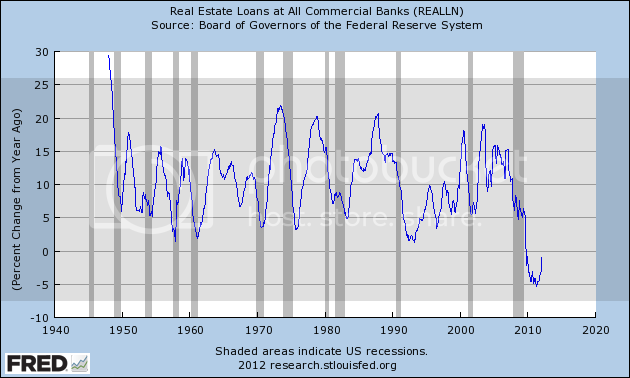 We see a pattern of slowing for the last three quarters -- obviously not a good development. The IEA estimates that the EU will spend a record $502bn this year on net imports of oil, up from $472bn in 2011. That represents 2.8 per cent of the bloc’s gross domestic product, whereas between 2000 and 2010 it was spending on average 1.7 per cent of GDP on oil imports. “The current price levels are on average higher than the awful year of 2008 [when oil hit a record high of $147 a barrel], and as such have the capacity to tip the global economy back into recession,” Mr Birol said in a speech in London. He noted that every recession in the industrialised countries since the second world war had been preceded by an oil price spike. The oil import bill is creating an additional burden for Europe’s hard-pressed consumers. European households will spend close to 11 per cent of income on heating, lighting, cooking and personal transport this year, compared with the historical average of 6-7 per cent and 9 per cent last year, Mr Birol said. Ideally, the central bank would raise interest rates a touch to stave off inflationary pressures -- and given that rates are at 1%, there is plenty of room to raise. But, overall EU unemployment is increasing, which is hurting retail sales on both a month over month and year over year level. Unfortunately for the ECB, the best policy response is to hope that "high commodity prices are the cure for high commodity prices" -- that is, as oil increases in price, demand drops, thereby lowering commodity prices. This is not the best option for a central bank. Now, consider the equity averages of the three largest economies. 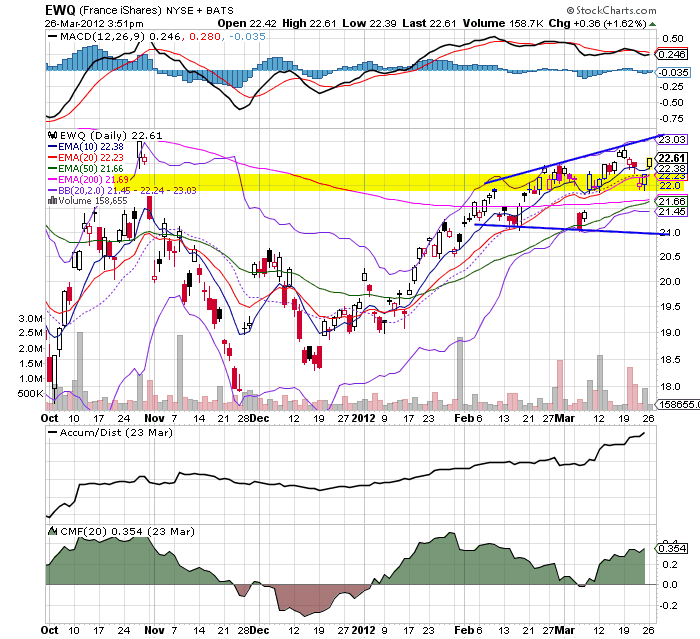 The French market is in the middle of a broadening triangle pattern, just above the 200 day EMA. Momentum is dropping, but the volume indicators are rising. 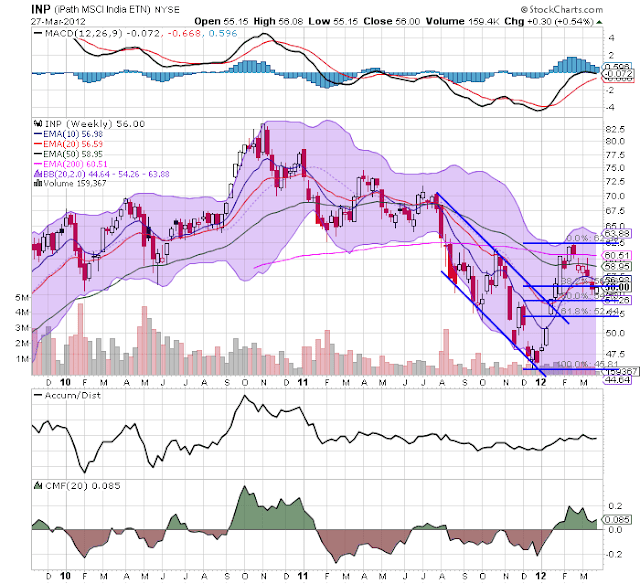 The Bollinger Bank width is weak, indicating a period or rising volatility is probably closer than we want to think. Prices are just above highs in the 22 area that the market reached back in late October. The German market is very similar to the French market. 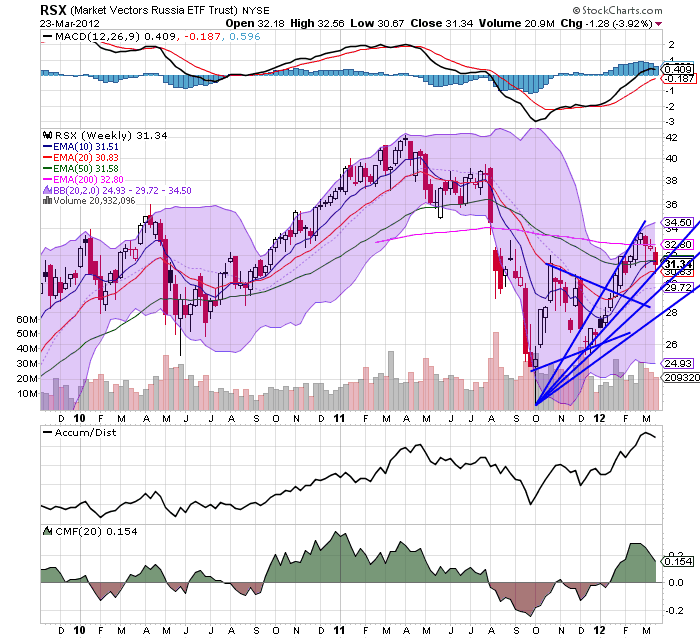 Prices have been trading in a two point range, but on declining momentum. The British market is moving sideways, just about levels established in late October. Here we see prices trading in a 1 point range on declining momentum. The euro has been moving sideways since February, moving between the 130 and 134 area. The EMAs are very tangled, preventing the drawing of any major conclusion about the future market direction. The sum total of all the above charts is this. Europe is weak. Unemployment is rising, which is lowering consumer spending. This in turn is lowering overall demand, which is lowering service and manufacturing demand. To make matters worse, interest rates are already low, so there is little the ECB can do from that end. In addition, an oil price spike is hemming them in as well -- which is also lowering overall consumer demand. The best chance for arbitrage above would involve the French market, but that's still not a great opportunity. So, in conclusion, Europe is not looking that good right now.